It may not look all that impressive, but somehow in the midst of illustration commissions and traveling and work and a toddler sleep strike, I've been making slow but steady progress on my two knitting projects--switching back and forth between them at random as needed when boredom begins to creep in. What's actually impressive about this is that I had the patience to knit a stockinette swatch and a lace swatch and block and dry them before diving right in... I have always foolishly skipped this step, which is why the first sweater I knit for myself ended up donated to the Goodwill, and the second sulks in my "to-fix" drawer. 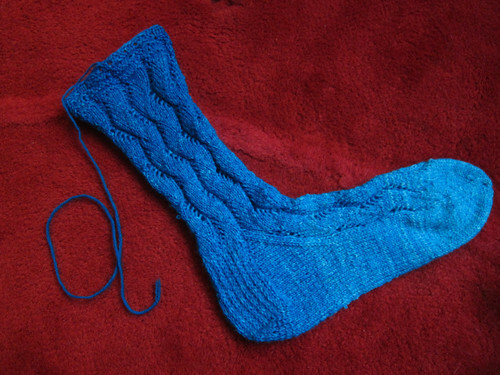 But in real life, the sock top is definitely a very dark turquoise gradually fading to a very light turquoise at the toe--hard to see in photos, but just trust me! 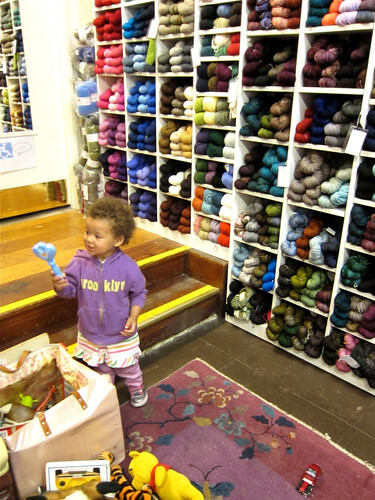 Most importantly for me, they also had a toy corner to distract my toddler from pulling said yarns off the shelf while I browsed. What do you wish you could be sewing right now, but can't find the time? P.S. Due to my hectic life lately I have totally lost control of all my sewing-related RSS feeds and it is bumming me out. I have over 1,000 unread posts, and my attempts to just target even my top top top favorite blogs for catchup have completely failed. I'm thinking it's time for a "Mark All As Read" amnesty here. 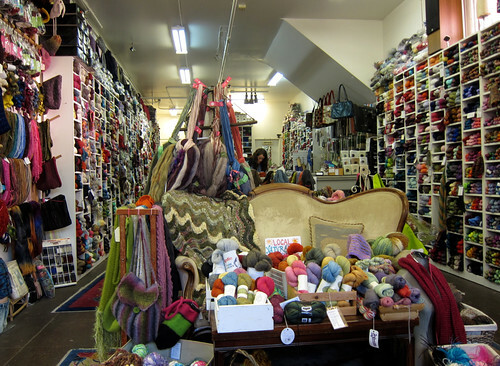 Wow that looks like yarn heaven! 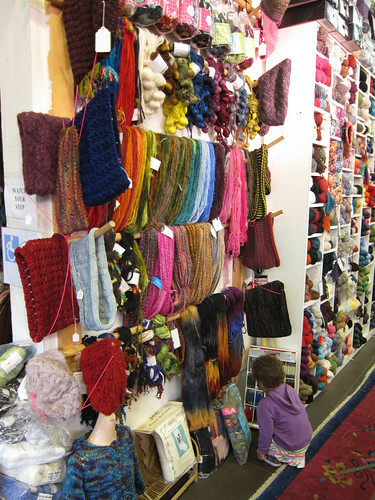 We don't have that kind of yarn shops here. 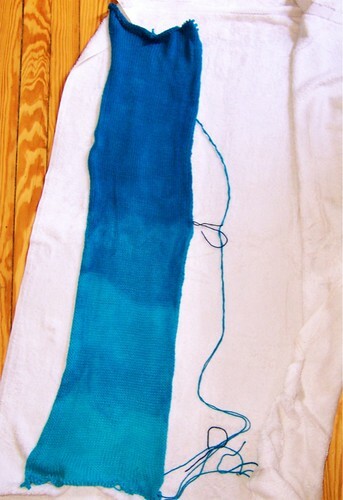 I'm impressed you only bought yarn for your next project. To answer your question. I would love to sew a bunch of summer dresses. But I have my job and I have to prepare for my exam for my sewing course. So I have to wait a couple of weeks to finally get the time to sew the dresses. I am learning knitting and crochet. Still getting to grips with sewing hehe. Keeps me busy. UMMMM I don't even watch Dr Who but I would wear the hell out of those Tardis socks! Those things are so awesome!!! Def time for mark all as read (except for my posts :-)) And Z is SO big! What a cutie. 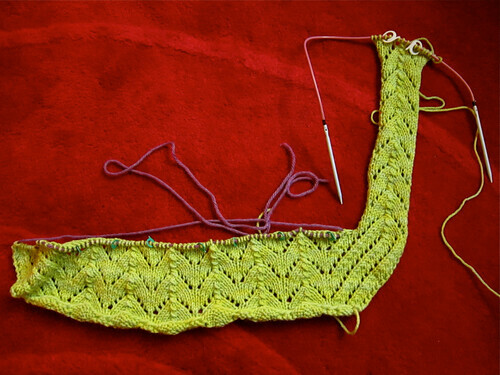 BTW, just started knitting my new sweater yesterday. Maybe we should have a competition to see who can finish first - just to keep us highly motivated! Ha, well, I will NOT be competing with anyone... I knit slowly and in small increments to prevent a flare-up of my carpal tunnel. You are making those socks, and thus, my hero for eternity. I'm glad you had a great time in San Francisco. And, I can definitely empathize with the overflowing reader. 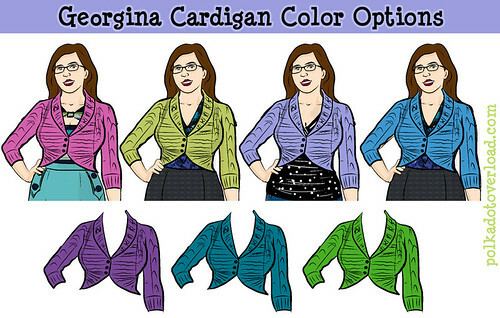 It's crazy how prolific sewing bloggers are, right?! You go away for a weekend, let alone go on a real vacation, and it's too crazy to comprehend reading every post. Mark all as read.